The goal of many skilled auto repair industry individuals is to open their own auto repair shop at some point in their career. The key to a profitable, efficient shop requires much more than skills and determination. The type of equipment used for automotive repairs will play a key role. There are a number of repair equipment needs that will be essential in performing even the most basic repairs quickly and reliably for your customers. An air compressor operates a variety of tools and equipment in a complete auto repair shop. That is why it is important to purchase the right one. Normally, you want a larger compressor between 60-120 gallons. Besides capacity, there are many other factors to take into considerations, such as how much PSI, what style pump needed, horsepower, and cubic feet permit minute. All automotive businesses should possess a jack to work underneath a vehicle. Safety is key and you should never overlook the quality of a jack. There are many jacks on the market ranging in price and quality. But keep in mind, there are over 10,000 injuries involving jacks each year. It is worth the expense to ensure your shop is operating safely and efficiently. Whether you are new to the ownership of an automotive shop or an expert collision repair center with years of experience, dead batteries will come as no surprise. 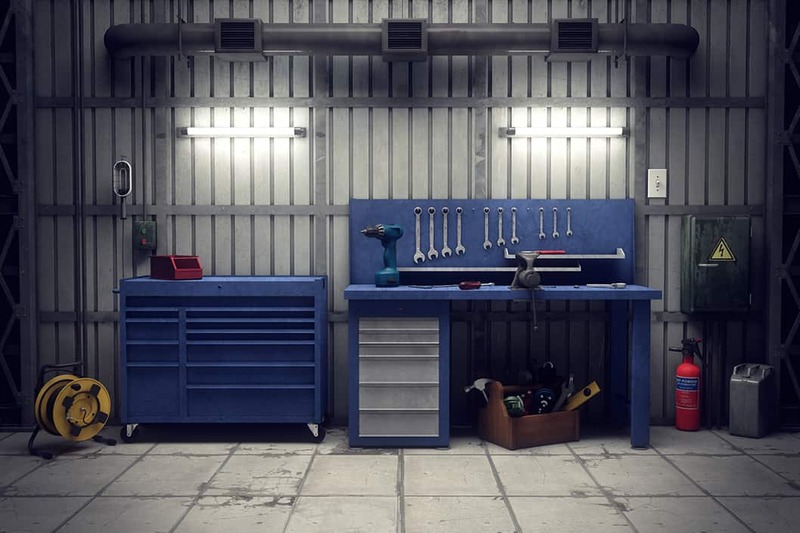 A charger or jumper will come in handy and actually prove to be a necessity to keep your shop moving like a fine-tuned engine. If you ever plan to work on engines and need to be able to take it apart and rebuild them, you should invest in an engine hoist. Engine hoists allow easy removal the engine without any backbreaking pain. The most important thing about these is to get one that supports the maximum weight for what you will be servicing. For a complete repair shop, air conditioning unit issues are a common occurrence. These machines in recovering, recycling and recharging faulty air conditioning systems in vehicles. A vehicle lift raises an automobile allowing your technicians the room it takes to work under the vehicle. This is one piece of equipment you need to invest wisely. The average life of a cheaper vehicle lift is about 2 years, and they can be dangerous. There are many types of vehicle lifts to choose from ranging from two-post to scissor lifts. No matter what lift you chose to use it is important to consider the safety features each lift has to offer. Not all paint booths are created equal. Type, size and shop space available should all be taken into consideration when choosing a quality paint booth. Spray booths, finishing and mixing stations will all factor in when providing a top-notch, quality automotive finish for all of your collision repairs. A clean and organized collision repair shop is a sure to keep your workflow moving in the right direction. We offer a variety of Shure Manufacturing workbench systems, tool storage, parts department storage and shop equipment solutions.